The controversy over Barrick’s exports led President John Magufuli to fire the minister of mining and the board of the Minerals Audit Agency. Tanzania’s parliament has also voted to review mining contracts and to block companies from pursuing the country in international trade tribunals. At least 22 people have been killed and 69 injured near or at the North Mara mine since 2014. Most of the victims were impoverished villagers who scratch rocks for tiny bits of gold and who often mined these territories prior to Barrick’s arrival. An early 2016 government report found security and police paid by Barrick had killed 65 people and injured 270 at North Mara since 2006. Tanzanian human rights groups estimate as many 300 mine-related deaths and the Financial Times reports that not a single police officer or security guard working for the company has been killed on duty. The latest US sanctions targeting Russia’s oil and gas sector will cause Gazprom some headaches in building the new gas pipeline to Germany, experts say. However, US restrictions are unlikely to stop the project. “The price of any project automatically increases,” Tatiana Mitrova, director of the Skolkovo Energy Center told Reuters. “Gazprom’s relationships with partners, subcontractors, and equipment and service providers are very complicated. They will all ask for a risk premium,” she added. “This, however, does not mean that Nord Stream-2 won’t be built,” said Katja Yafimova of the Oxford Energy Institute. However, while Gazprom’s major partners in the projects – ENGIE, OMV, Shell, Uniper, and Wintershall – are likely to accept the risks, smaller contractors will be more cautious. “Not all partners can afford to see things through with Gazprom,” said Valery Nesterov, an analyst at Moscow-based Sberbank CIB. “Unless Trump takes a really sharp turn, it is highly unlikely that companies that are supplying pipeline goods are going to be punished in the next year or so,” Richard Nephew, a former US deputy chief of sanctions told Reuters. At the same time, Gazprom’s long-term projects can be affected. “A lot of companies are now thinking: ‘I’ve got maybe 12, maybe 18 months in which I can do some stuff but after that maybe I won’t’,” he added. The Nord Stream-2 pipeline plans to double the delivery capacity of Russian natural gas to Germany from the current 55 billion cubic meters of gas per year. Ukraine’s Security Service have launched an investigation into a journalist and blogger whom they accuse of treason as well as his alleged attempts to violate the country’s territorial integrity via publications critical of the government in Kiev. “Since 2014 the journalist had been writing tendentious articles at the request of the Russian government propaganda news agencies,” the agency said without releasing the name of the suspect. His work has had a “manipulative influence on the readers’ minds” and threatened “the sovereignty and independence of our state,” the SBU claimed. The blogger, identified by the Ukrainian media as Vasily Muravitsky, was publishing his articles on at least six websites, the SBU said, adding, that the man initially signed his work under his real name, but started using aliases after that. The journalist’s works also allegedly contained “calls to incite national enmity within the country and between Ukraine and neighboring friendly states,” the security agency added. If found guilty the opposition journalist may face up to 15 years in prison, according to Ukrainian authorities. “The mass closure of Russian news and internet media outlets as well as persecution and oppression of the Ukrainian journalists conducted on a large scale are blatant violations of the fundamental principles of the freedom of expression that lie at the core of the civilized approach to the media and are embodied in the key documents of the UN, OSCE and the Council of Europe,” the statement said. The Russian army says it has reached a deal with foreign-backed militants in Syria to create a new de-escalation zone in the country’s northern parts of Homs province. Russian military spokesman Igor Konashenkov made the announcement on Thursday, saying that new safe zone will span 84 towns and villages populated by more than 147,000 people in Homs. The official noted that a ceasefire was to take effect in the area at 12:00 p.m. local time (0900 GMT) on Thursday. The zone is the third to be established in Syria under a Russian-led initiative aimed at halting clashes in four key conflict zones between Syrian government forces and anti-Damascus militants. Last Saturday, the warring sides agreed on a deal declaring Eastern Ghouta as a de-escalation zone. Russia, along with Iran and Turkey, brokered the deal for establishing four de-escalation zones in mainly militant-held areas of Syria during ceasefire talks in the Kazakh capital city of Astana in May. It covers the northwestern Syrian province of Idlib, northeastern areas of the western coastal province of Latakia, western areas of Aleppo province and northern parts of Hama province. The parties to the Astana talks are now working on the details of the deal. London-based voting machine maker Smartmatic claims the recent polls carried out in Venezuela this week were rigged. In their 5 minute video statement, however, they failed to provide any evidence. The number of Venezuelans who participated in the election for an all-powerful constituent assembly was tampered with – off by at least 1 million votes – in an official count, the head of a voting technology company asserted Wednesday, a finding certain to sow further discord over the super-body that has generated months of nationwide protests. Smartmatic CEO Antonio Mugica said results recorded by his systems and those reported by Venezuela’s National Electoral Council indicate “without any doubt” that official turnout figure of more than 8 million participants was manipulated. Since no opposition auditors were there, no evidence has been provided that such irregularities occurred. Neither AP’s article nor Mugica’s full statement provide any evidence or explanation as to how Smartmatic “estimated” the final count regarding participation was off by “one million votes.” Mugica doesn’t even explain whether it was one million more than reported, or one million less. This latest announcement, absent of any evidence to substantiate these accusations, calls into question Smartmatic’s professionalism, ethics, and impartiality. Other nations considering Smartmatic machines must consider the possibility that the company’s CEO may attempt to use his machines and their role in tallying votes to manipulate their internal politics as well. This announcement also once again calls the Western media into question for failing to note the very obvious inconsistencies between Mugica’s conclusions and the lack of evidence provided to substantiate them. What could be more damaging to national security if the US president can’t talk to a foreign leader frankly without the fear of his or the other person’s comments going public, questions former US diplomat Jim Jatras? The Washington Post published Thursday two leaked confidential transcripts of President Trump’s phone calls with foreign leaders. Both calls took place in January and, according to the paper, the transcripts had been prepared by White House staff, but not released. According to the call records, Trump insisted Mexican President Enrique Pena Nieto, stop publicly saying his country will not pay for Trump’s proposed wall on the US-Mexican border. Additionally, the report revealed details of Trump’s phone call with Australian Prime Minister Malcolm Turnbull on the issue of refugees. The leak comes a day before Attorney Jeff Sessions is scheduled to hold a news conference detailing efforts to crack down on leaks. RT: How damaging is it to US national security that the president’s confidential phone calls are leaked? RT: Could these leaks of the president’s confidential phone calls make foreign leaders less apt to speak openly with the US president? JJ: Of course, I think it is indeed a part of the purpose in leaking them in the first place – to put a chilling effect on anything this president might do while they continue to set him up for removal. I’ll be very interested to hear what Attorney General Jeff Sessions has to say. Frankly, from the day he walked in his office, the first thing he should have done was convene a high-level task force to track down these leakers, prosecute them and put them in jail. He should have impaneled a Grand Jury months ago. Meanwhile, we hear today that Mr. (Robert) Mueller has impaneled a Grand Jury, even though we haven’t heard any evidence there has even been a crime committed. So there is a complete disconnect between the real criminality – we know it’s going on, it is not being dealt with – and these efforts to essentially bring down the constitutionally elected president. RT: White House staff reportedly made the two transcripts. What’s the likelihood there are one or more moles inside Trump’s team? JJ: It is very unlikely this came from Trump’s team or the White House. Remember one of the last things Mr. Obama did, when he left the White House was to open up the purview for distribution of certain types of information, which means a lot more agencies and a lot more bureaucrats if you will ‘deep staters,’ have access to this information. And of course, the Washington Post is a primary outlet for this kind of information and has a very cozy relationship with their, if you will burrowed in sources, mainly in the intelligence community. I’m guessing that is partly where it came out. Is it going to be tough to track down – you bet it is. So that is why you need a top investigatory team, whose job is to find it. RT: Do you believe that those who would like to undermine Trump have gone too far in their effort to show him in a bad light? JJ: It’s been going too far for quite some months now. Indeed from even before Mr. Trump took the oath of office these efforts were already underway. It is a conscious effort, if you will, a conspiracy to overturn the results of the election. This is simply another symptom of it, and you can bet that tomorrow and next week there’ll be another shoe dropping, and another shoe dropping, and another shoe dropping, and this will continue going on. These people want to remove Trump; they want to neutralize him, pending that. But let’s make no mistake about what the agenda is here. Britain should raise the military recruitment age from 16 to 18 because joining the services at such a tender age can cause irreversible psychological damage, a British Army veteran has told RT. Wayne Sharrocks, who joined the army when he was 17, has spoken out against current military regulations, which allow recruiters to accept under 18s, who are effectively children based on international standards. Sharrocks is calling for the recruitment age to be raised following a recent report published by Veterans for Peace (VFP) UK, which sheds light on the detrimental effects of army training on soldiers in general, and young people in particular. Twenty-two out of every 100 British soldiers are under the age of 18. However, they are exempt from combat operations until they reach adulthood. The 72-page report, ‘The First Ambush? Effects of army training and employment,’ says military training alone increases violent offending among recruits, with the rate of offenses rising again once they return from the front line. The report, assembled through the testimonies of army veterans and more than 200 separate studies, also found recruits are twice as likely to drink heavily – all factors which may in turn lead to unemployment and homelessness. Regardless of recruitment age, Sharrocks believes “military training and culture is damaging and not healthy for a person to go through.” But because young people’s minds are more “malleable” than those of adults, the effects of training are far worse for them. It emerged last month that the British Army is actively trying to fill its ranks with young people from households with a £10,000 (US$13,000) annual income. In a document for the British Army’s ‘This Is Belonging’ campaign, seen by the Independent and Child Soldiers International, the military says it is deliberately targeting 16 to 24-year-olds from social classes known as C2DEs – denoting the three lowest ranks of society. The VFP report says the British Army “strategically” targets such youngsters from deprived neighborhoods by presenting a “romanticized” image of the soldier. Members of the Scottish Parliament have backed a petition calling for further research into military recruitment of youth. There have also been calls by the Scottish National Party (SNP) Youth for a review of the policy on military recruitment age, but a motion to raise it was opposed by senior MPs in December last year. Sharrocks, who twice served in Afghanistan and left the army after being severely injured by an improvised explosive device (IED), said more information should be made available to young people so they know what they are signing up for. The spokesperson added that the Armed Forces allows for everyone, regardless of their background, the opportunity to reach their full potential, before adding it is encouraging young people to “aim higher” while “teaching them valuable skills”. Such practices can lead to long-lasting psychological issues such as post-traumatic stress disorder (PTSD), which can lead to suicide. VFP UK describes the case of Dan, who joined the army at 18 and developed PTSD after training and service in Iraq. When he returned to Britain, he served time in a military prison for assaulting a warrant officer. “After the conviction the army wouldn’t support me, my mental health deteriorated and I was left feeling isolated and alone. “I resorted to alcohol abuse and became homeless for a year, and I have suffered with chronic PTSD. Many find themselves in manual, low-skill factory jobs. Rather than leaving charities to pick up the pieces, Sharrocks appealed for more to be done to smooth the transition from soldiering to civilian life. Writing for the ForcesWatch website, Douglas Beattie, a member of VFP UK, said soldiers are dehumanized right from the start, regardless of their age. He also said soldiers become targets of “beastings” – humiliating treatment involving both verbal and physical violence, aimed at the individual’s utter debasement. 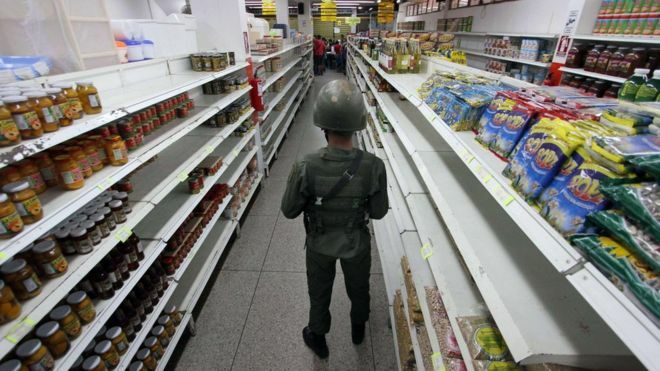 Venezuela’s ongoing crisis is not driven by political ideology – it is not a battle of socialism versus capitalism or dictatorship versus democracy – it is the result of two centers of political power possessing opposing interests and colliding geopolitically. The nation of Venezuela is currently under the control of Venezuelans who derive their support, wealth, and power from Venezuela itself – its people and its natural resource. This political order also receives aid and support from Venezuela’s economic and military partners both in the region and around the globe. As early as 2002, US-backed regime change targeting then Venezuelan president Hugo Chavez, sought to violently overthrow Venezuela’s political order and replace it with one obedient to Washington. Current leaders of the opposition were not only involved in the 2002 failed coup, many are documented to have received political and financial support from the United States government ever since. Maria Corina Machado, founder of Sumate, an alleged Venezuelan election monitoring group, funded by the US National Endowment for Democracy (NED), meeting with US President George Bush who presided over the failed coup attempt against President Hugo Chavez. US State Department documents reveal that the department itself along with US-funded fronts posing as nongovernmental organizations (NGOs) have been providing Venezuela’s opposition with support. 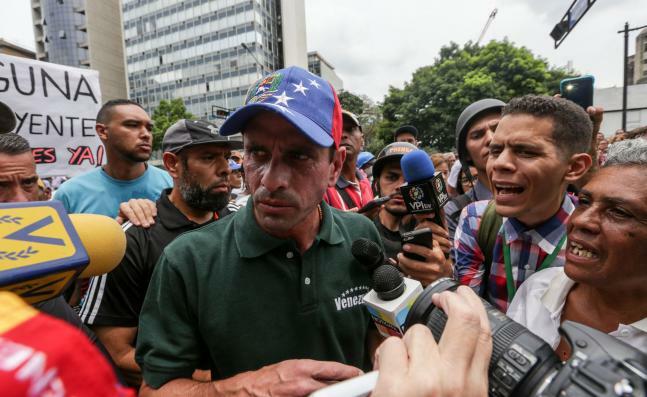 This includes a report titled, “Status of Capriles and Sumate Cases,” referring to the above mentioned Henrique Capriles Radonski and Sumate, a US National Endowment for Democracy (NED) funded front posing as an election monitor. Currently, NED’s own website features an extensive list of activities it is engaged in within Venezuela’s borders. It includes leveraging human rights for political gain, electoral manipulation, building opposition fronts, and expanding pro-opposition media. While each activity is labelled with benign titles, it is clear that none of these activities are done impartially, and as State Department documents reveal, these activities are done specifically for the benefit of the US-backed opposition. In reality, AEI is talking about dismantling entirely the obstacles that have prevented the US and the corporate-financier interests that direct it, from installing a client regime and extracting entirely Venezuela’s wealth while obstructing, even dismantling the geopolitical independence and influence achieved by Chavez in Venezuela, throughout South America, and beyond. By “Venezuelan democrats,” AEI means proxies created, funded, and directed by Washington, including Primero Justicia and the street mobs and paramilitary units it commands. While the Western media attempts to frame Venezuela’s crisis as a result of “socialism” and “dictatorship,” it is clear by reading the West’s own policy papers that it is owed instead to a systematic assault on Venezuela’s sociopolitical stability and economic viability, spanning decades. Venezuela is not the first nation in South America that the United States has sought to overturn by undermining its economy. Considering America’s extensive list of interventions, wars, and occupations it is currently involved in worldwide and the manner in which each was presented to the public – with ideology and humanitarian concerns used to manipulate public perception, and considering Venezuela’s opposition is a documented recipient of US support, it is clear that yet another intervention is under way, this time in South America. In a world moving toward multipolarism and greater decentralization on all levels, Venezuela’s collapse and a victory for Washington would undo an increasingly balanced distribution of geopolitical power – both in South and Central America, as well as across the world. As a major oil producing nation, US control over its people and natural resources would further allow the US and its allies to manipulate energy prices toward achieving future goals – particularly in terms of encircling, isolating, and dismantling other centers of political power dependent on oil production for economic prosperity. One needs not be a fan of “socialism” to understand that the ultimate outcome of Venezuela’s collapse will be a further concentration of power in Washington and Wall Street’s hands. Such power, regardless of whatever ideology it is superficially wielded behind, will always be abused. Regardless of the alleged form of government a nation may take, as long as it is a step away from unipolar globalization, it is a step in the right direction. 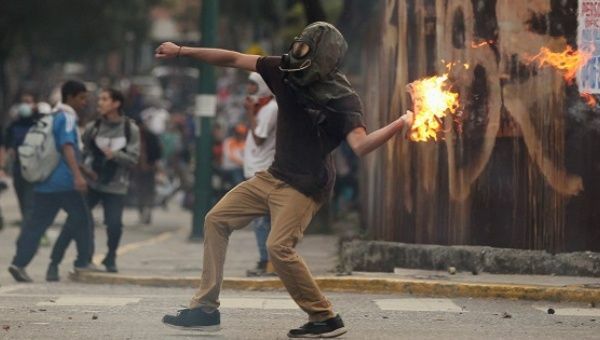 The crisis in Venezuela is not one of socialism versus capitalism or dictatorship versus democracy – it is one of hegemony versus national sovereignty, of centralized unipolar power versus an increasingly multipolar world. A sovereign and independent Venezuela allowed to pursue its own destiny is one in which its own people will naturally seek to decentralize and distribute power. 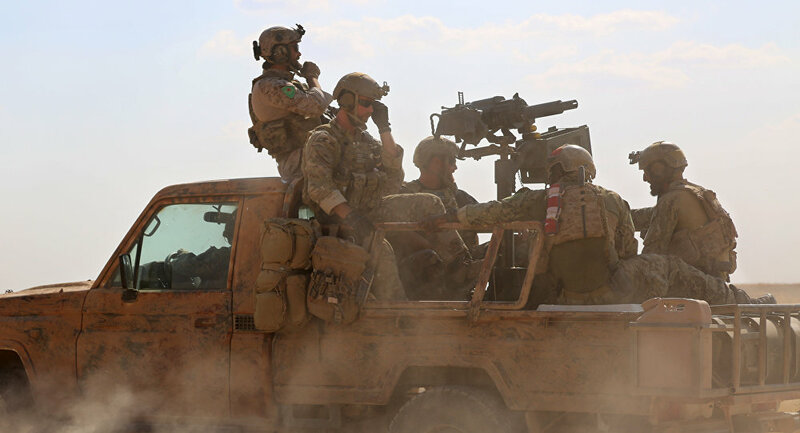 While the current government may not provide the ideal conditions to accomplish this, conditions under a US client regime – as US-wrecked Libya, Afghanistan, or Iraq prove – would be significantly less ideal.